Named by Maori for the sound of its call, the kea (Nestor notabilis) is endemic to the Southern Alps of New Zealand and is the world’s only mountain parrot. These sociable and highly intelligent birds are well adapted to their harsh environment. 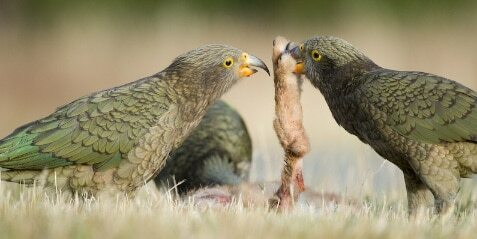 Unfortunately, the traits that kea developed for survival, their curiosity and omnivorous appetite, have created conflict with humans over the last 150 years. Persecution and predation have sorely depleted numbers and, with only a few thousand birds remaining, the kea is a Nationally Endangered species. Check out about the latest kea research projects; what's happening with kea in the wild and in captivity; what activities children can do at home and at school; how you can make a difference; or simply enjoy our latest newsletter. 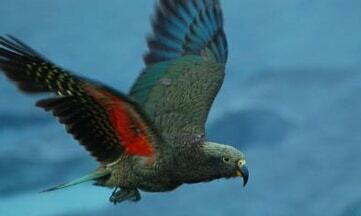 Kea are New Zealand’s alpine treasures. The Kea Conservation Trust works to preserve and protect these unique birds, both in their natural habitat in the wild and in captivity. In order to make our vision of a sustainable future for kea populations a reality, we need your support. If there’s anything at all you want to know about kea, you’ll probably find it in our Resources section. Research manuals and papers are free to download. We also stock books, DVDs and merchandise for purchase and have a comprehensive set of resources for schools. If you have seen a kea (dead or alive) please tell us. Did you know that kea get lead poisoning? Having trouble with 'curious' kea?